Spacious and bright townhouse in Paraiso Park, Benahavis, one step away from the golf courses and all services. Nicely located within the urbanisation, with direct access to the open gardens and pool area. An ideal holiday or family home. Main floor: Living and dining area with fireplace, fitted kitchen (part open plan), guest toilet. Direct access to the terrace and own garden. Carport. First floor: Master bedroom en suite and two guest bedrooms sharing a bathroom. Gated community. 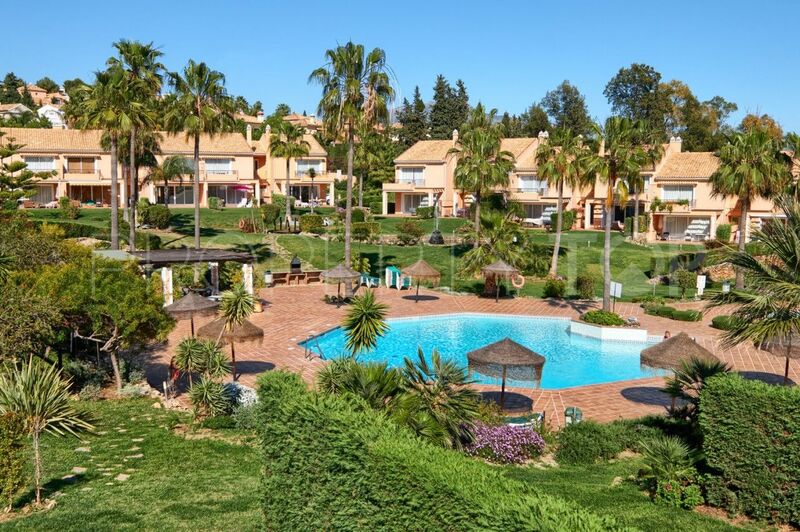 Close to restaurants, Mercadona supermarket and Atalaya and Paraiso golf clubs. Just a 5-10 minute drive to the beaches, San Pedro and Puerto Banus. El Paraíso Golf: 1 minute drive. Atalaya Golf Club: 2 minutes drive. Half a dozen golf courses less than 15 km away. Mercadona supermarket: 5 minutes drive. Atalaya School: 5 minutes drive. San Pedro de Alcántara: 5-10 minutes drive. Please, send me more information about ref LH00162 in Paraiso Alto, Benahavis or similar properties. Need Advice buying this property for sale in Paraiso Alto, Benahavis? Disclaimer This is a property advertisement (REF LH00162) provided and maintained by LibeHomes, Av. Salamanca s/n, Urb. Nueva Alcántara Edif. Los Naranjos, Bloque 3 Bajo A 29670 San Pedro de Alcántara (Marbella), and does not constitute property particulars. Whilst we require advertisers to act with best practice and provide accurate information, we can only publish advertisements in good faith and have not verified any claims or statements or inspected any of the properties. PropertyTop.com does not own or control and is not responsible for the properties, website content, products or services provided or promoted by third parties and makes no warranties or representations as to the accuracy, completeness, legality, performance or suitability of any of the foregoing. We therefore accept no liability arising from any reliance made by any reader or person to whom this information is made available to. Rights: You can withdraw your consent at any time, as well as access, rectify, delete your data and other rights by contacting info@libehomes.com.